Georgie and Nick's wedding was one of pure boho chic with lots of personal touches, from the bridal crown to the centerpieces. Georgie and Nick were looking for a unique venue and after visiting quite a few of them, they chose a fortified house that was built later on in the Fifteenth Century to defend attacks by pirates and bandits. 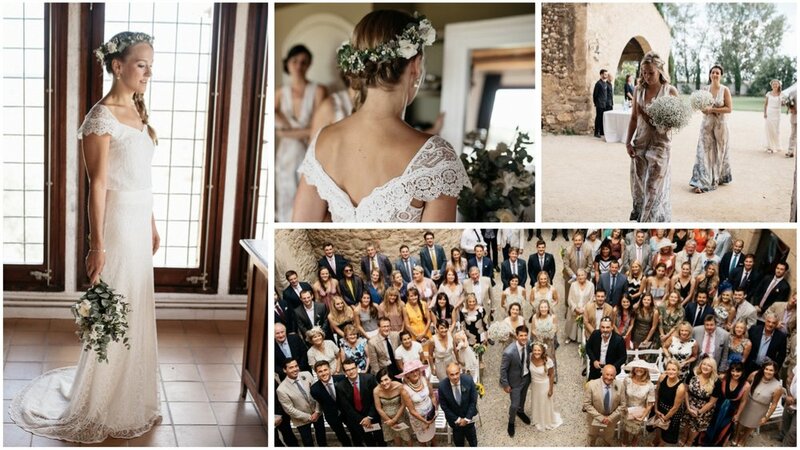 Having a good knowledge of the area as Georgie's family has a house in Tamariu, they knew that the food and wine was a very important bit of their beautiful wedding. Joker, the catering, did an amazing job satisfying everybody with the quality of the service and the food. The music was the other important bit. So, we hired a Cuban band that entertained all guests during the canapés and during the party. Once the band performance finished, a wonderful DJ took over and the party lasted until late at night. And love, lots of love was the last and most important bit of their exquisite wedding. Thank you very much, Georgie and Nick, for your trust.